I noticed that it was mainly trucks from Thiele Trucking of Owatonna hauling downtown snow to Babcock Park yesterday morning. A separate contract is awarded each year for the plowing of the nine City parking lots. Evidently City workers and City-owned equipment are used for everything else snow-related. When we first moved to Northfield in the mid-70s, garbage-hauling was done by City workers using City-owned trucks. At some point, a decision was made to contract it all out to Waste Management. Updated Jan. 5, 7 pm: Not true. See comment #5 below by Dave DeLong and my following comment. Under terms of a 2007 deal, union truck drivers earned huge overtime checks when heavy snows blanketed Chicago. But the cash-strapped mayor asked unions to give up overtime payments and accept compensation time instead to cut costs. The Teamsters union officials who represent the city’s drivers declined to agree to that concession and other pay-cut moves, even while other employee unions gave in to the mayor’s demands. 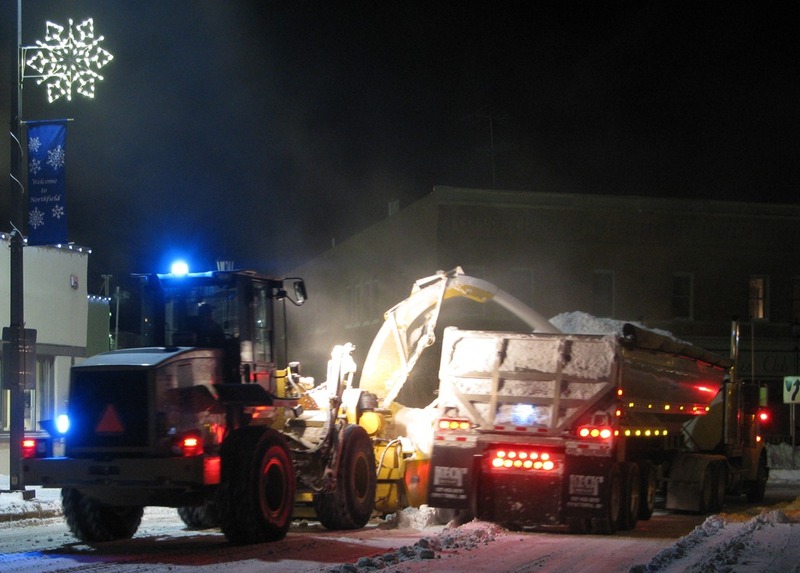 In this era of municipal cost-cutting, I’m wondering how Northfield’s current combination of public and private service delivery on snow plowing and removal emerged and whether it’s regularly reviewed for quality and price. Previous PostA reminder to walkers and bikers in the Carleton ArbNext PostWhich walks and trails get cleared of snow? I see from this snow hauling services agreement that the City pays any number of contractors $85-100/hr for removing snow. To be fair, I think that you should quote the document directly. It appears to me that this is the charge for the equipment, and it really does not seem to be that far out of line to me. John, I didn’t mean to imply any criticism of the arrangement. I just wanted to post the info that the parking lot snow plowing contracts are based on the number of inches per snowfall whereas the snow hauling is based on hours. Seems logical to me. It is interesting… I think it is probably correct, because the amount of investment to keep that kind of “non-standard” equipment on inventory would be terribly expensive. Most times, the city would not need a bunch of semi-length dump trailers. Much easier to contract them out. $85 to $100 per hour for the equipment and the operator seems very reasonable… not exactly sure if the operator labor is included. I will have to give kudos to the crews. They have been very good about clearing 7th between Division and Water early enough (5:30 AM) so that we can park and catch the Northfield Express. I don’t remember City workers and City trucks for garbage hauling. I know Northfield Disposal (Draves and Sabyen) hauled for years as did Brockton. I even remember going out to the City dump (now compost) on the back road to Dundas. I remember Hy Kivens junk yard but I can’t remember City owned garbage trucks. I know the relationship with private haulers changed when Rice County opened it’s landfill and said all garbage must come here, which is hard to inforce with private haulers who don’t have a contract with the City. Northfield Disposal was bought out by Waste Management. Northfield used to contract with local farmers with their grain trucks for hauling snow from downtown but legal questions about inspected equipment,insurance,and liability put an end to that and now instead of a little extra cash for local farmers you have an Owatonna trucking firm. The City is doing more and more contracting out – park and rec. and accounting temps, snow removal, building maintenace. They have reduced, eliminated, and layed off on the lower end of the pay scale. When you don’t have as many Indians do you still need as many Chiefs? David, thanks for the historical update and correction on my assertion that the City workers and City-owned trucks did the garbage hauling. I’ve corrected the blog post above. In 1997 the City entered into a 5-year contract with Waste Management that expired at the end of 2002. In 2002 the contract was negotiated and extended until 2007. The City has contracted with Waste Management and formerly Northfield Disposal Company (Sabyan Disposal) for 20 years or more. Northfield has contracted locally with Waste Management for at least 25 years. Approximately 15 years ago Waste Management bought out locally owned and operated Northfield Disposal Company. After several years of continued negotiated contracts the City solicited bids for residential collection services in 1997. Waste Management did not provide the low bid, however their prices were very competitive and had provided good service to the City and the City choose to enter into another contract with Waste Management. In 2002 a new contract was negotiated with Waste Management for 2003 – 2007. This will be the first RFP request for residential waste services in 10 years. David, as for your wondering whether the City staff is top-heavy given the cutbacks, layoffs and contracting, can you be more specific as to which departments could be looked at more closely?